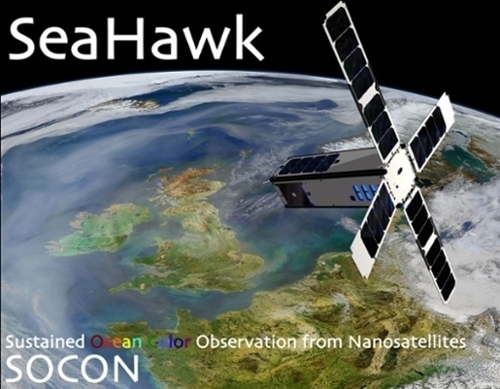 SeaHawk-1 Ocean Color Cubesat is in orbit! The University of North Carolina at Wilmington (UNCW) has been funded by the Gordon and Betty Foundation for technology demonstration as “proof of concept” for development of a “game-changer” in the method to collect and disseminate Ocean Color Data via use of Nanosatellites. The goal of this project is to enhance the ability of the earth sciences to observe ocean color in high temporal and spatial resolution modes through use of a low-cost, next generation, miniature ocean color sensor flown aboard a CubeSat. A CubeSat is a type of nanosatellite with volumes in multiples of 3.0 liter (30cm3), and typically uses commercial off-the-shelf (COTS) components for its electronics. Our team is under contract to develop, construct, launch and operate 2-SeaHawk CubeSats with HawkEye Ocean Color Sensors. UNCW will be one of the only non-governmental operators of an Environmental Remote Sensing Satellite --- data will be handled by NASA and made available from UNCW to the International Ocean Color Community. Ocean color satellites provide a unique vantage point for observing the changing biology in the surface ocean. SeaWiFS, which finished its remarkable 13-year mission in 2011, “set-the-bar” transforming biological oceanography and providing data critical to advance our knowledge of how such changes affect important elemental cycles, such as the carbon and nitrogen cycles, and how the ocean’s biological processes influence the climate system and allow us to monitor the biological consequences of that change - to see how the things we do, and how natural variability, affect the Earth's ability to support life and assess changes in primary production, which forms the base of the marine food chain. Using nanotechnology, we are construction an instrument with 8 times the resolution with a development time and construction cost of both approximately 10% that of SeaWiFS. A team of scientists and engineers from University of North Carolina Wilmington, Cloudland Instruments of Santa Barbara, CA, Clyde Space of Glasgow, UK, NASA Goddard Space Flight Center, Greenbelt, MD, led by UNCW Professor John M. Morrison, in early January 2015 funds from the Gordon and Betty Moore Foundation as a "proof of concept to demonstrate capability to construct low-cost autonomous nanosatellites to provide sustained, high spatial resolution and temporal resolution information about the surface ocean processes." The "science dream team" is composed of investigators that have been involved in the forefront of Ocean Color Remote Sensing since its inception 30+ years ago. Program review in 2017 determined that the design, and construction of 2 – 3U Satellites --- SeaHawk-1 and SeaHawk-2, outfitted with HawkEye Ocean Color Sensors, were nearing launch readiness. In June 2017, and we entered into Phase 2 of the program, “support one-year, proof-of-concept SeaHawk/HawkEye Missions for each of the satellites including: management; preparation, pre-launch testing and launch; satellite telemetry, tracking, and command; data downlink; data processing, calibration, distribution and storage; and, in situ vicarious calibration,” from the Gordon and Betty Moore Foundation. The first of the 2 SeaHawk Ocean Color Cubesat, outfitted with HawkEye Ocean Color Sensors is currently ready for launch. The satellite was integrated (http://spaceflight.com/integration-for-our-sso-a-mission-is-underway/) into the launch module in Seattle, Washington, in early October 2018 and transported to Vandenberg Air Force Base in California, in late October, 2018. WHAT DO WE MEAN, OCEAN COLOR?